Divination is an integral part of the Samhainn celebrations, since the eeriness of the occasion provided the perfect conditions for such things. An appropriate setting is therefore essential, with turnip-lanterns providing the lighting (with additional candles and subdued lighting to provide a supplement if necessary), autumn foliage, flowers and berries providing the decorations and a fire – if possible – providing the focal point. Storytelling, music and song should set the scene, with participants dressed in appropriately eery disguises and games and feasting to follow. Below are a selected number of games and divinations that were – and in many cases still are – traditionally held at Samhainn. Dookin’ for aipples (or bobbing for apples) is a game that’s spread across Britain and Ireland (and, of course, beyond), so it’s something that most people are familiar with. There are a number of different ways to play it, depending on how adventurous your participants are, and how much you want to clean up afterwards! The basic game is to get a large tub of water and put in as many apples as you have players. They each then take it in turns to try and grab an apple using only their teeth. In some places the game is played with fortunes hidden into each apple – small charms that are secured into the flesh, and then each player reads their fortune for the coming year depending on what they get (the charms being the same as the ones used in the ‘crowdie charms,’ below). Alternatively a penny may also be thrown into the tub; whoever manages to lift the penny with their teeth will see great fortune in the year, and they get to keep the penny. Another version of the game uses a large dish of flour instead of water. 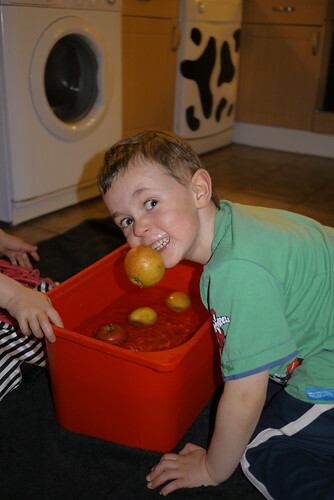 This is a good alternative if you don’t have a large tub for the water, and the players must again try to pick up an apple using only their teeth. As they do this the players will more than likely get covered in the flour and much sneezing (and laughter) ensues.Traditionally you’re supposed to keep your hands behind your back when you dook, but it’s not a hard and fast rule. The apples are to keep, of course, and they can be eaten straight away. Some people like to keep them for use in other divination rites later on, though. If you want to use water for dookin’ but there are participants who don’t want to get their faces wet, they can try using a fork to ‘spear’ an apple in the water instead. The fork should be held in the teeth as the participant leans over the tub and aims it at an apple of their choice, then lets it go. If the fork sticks into an apple, they’ve won it. This is an easier method than simple dookin’ – especially nowadays considering the fact that apples tend to be way bigger than they used to be (unless you pick them from your own tree) – but you can make it more difficult by churning the water up so the apples are moving around. Stealing the kail stocks or turnips isn’t such a big thing these days but my husband has fond memories of doing it back in the 70s. It was one of the only outdoor games that was done in a group – most other rites were performed alone. Groups of children or young people would go to the fields and try to steal the kail (or turnips) without the landowner’s knowledge – it was believed that otherwise the kail would be of no use for divination (I have not seen anything to suggest that turnips were likewise used for divination). The turnips might be used for carving or lobbing at houses to annoy nasty neighbours. A small of rod of wood is suspended from the ceiling, with a candle fixed at one end of the rod and an apple balanced at the other, just above head height. With the candle lit (originally it was a fir candle, but any kind will do), the rod is then spun round and everybody takes it in turns to jump and try to catch the apple with their teeth, and without using their hands. This divination is generally performed by those yet to be married, to see if they are destined to be with whoever they might desire at the time. These can be adapted to more contemporary concerns and can easily be incorporated into a group rite for a modern celebration, with the whole group helping to make the crowdie, or else it can be made in advance in individual containers, one charm to a dish, or one large dish. 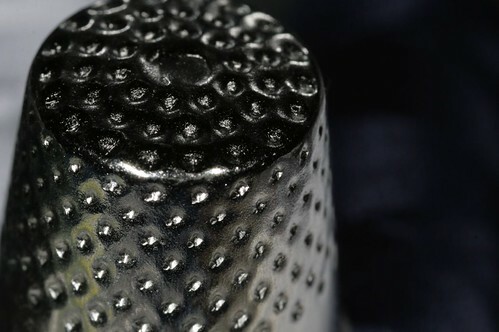 Long-term, silver charms for a charm bracelet could be used, but given the initial cost of buying them they could be collected over the years and makeshift charms used in the meantime. Wooden charms could be carved, or small gingerbreads baked into the appropriate shapes or with the symbol drawn into them, could be used instead. Another love divination, which can be done in a group or on your own. Twelve candles are placed in a circle, each one representing a month of the year. Everyone takes their turn to jump over each candle, with a clear jump denoting a good month, and any candles that get knocked or blown out as they are jumped denoting misfortune of some sort or another.11 (It helps to have someone make notes for this one). Many of the divinations and games are similar to those found in Scotland – the dookin’ for apples, the apples and candles, the burning of the nuts, the eating of a salt herring, the hidden charms17 – but there are enough differences to warrant separate entries for Irish rites as well. Young adults, on the other hand, would gather together for tricks, dares and tests of skill and strength, as well as general mischief. Hallowe’en barmbracks are still sold in west country Cork with hidden objects baked into them – a pauper’s rag gives an obvious clue to the finder’s fate, or the usual ring to signify marriage may be found.23 Charmingly, a chip of wood signifies that the recipient will be beaten by their partner, with the thimble for a spinster and the button for a bachelor as in Scotland. Similarly, the charms might be put into colcannon or champ instead.24 There are barmbracks on sale in most supermarkets in the run up to Hallowe’en that contain a penny “for luck” for whoever gets that portion. Similar to the circle of ash and stones described above, ivy leaves (without spot or blemish) are gathered and placed in a glass by each member of the family or gathering. These are left overnight and if the leaf is still spotless in the morning it is a good sign – a spot foretells an altogether more terminal destiny before the year is out. 1 McNeill, Hallowe’en, 1971, p40. 2 McNeill, The Silver Bough Volume III, 1961, p32. 3 Black, The Gaelic Otherworld, 2000, p561. 4 Black, The Gaelic Otherworld, 2000, p562. 5 McNeill, Hallowe’en, 1971, p44. 6 McNeill, The Silver Bough Volume III, 1961, p33-34. 7 McNeill, The Silver Bough Volume III, 1961, p34; Hallowe’en, 1971, p45. 8 McNeill, Hallowe’en: Its origin rites and ceremonies in the Scottish tradition, 1971, p53-54. 9 McNeill, The Silver Bough Volume III, 1961, p34. 10 McNeill, The Silver Bough Volume III, 1961, p34. 11 McNeill, The Silver Bough Volume III, 1961, p35. 12 Grant, Highland Folk Ways, 1961, p359. 13 Black, The Gaelic Otherworld, 2000, p560. 14 McNeill, The Silver Bough Volume III, 1961, p36. 15 McNeill, The Silver Bough Volume III, 1961, p39. 16 Napier, Folklore, or, Superstitious Beliefs in the West of Scotland Within this Century, 1879, p121. 17 Danaher, The Year in Ireland, 1972, p202-205. 18 Danaher, The Year in Ireland, 1972, p214. 19 Danaher, The Year in Ireland, 1972, p205. 20 Danaher, The Year in Ireland, 1972, p205-206. 21 Danaher, The Year in Ireland, 1972, p206. 22 Danaher, The Year in Ireland, 1972, p202. 23 Kinmonth, Irish Rural Interiors in Art, 2006, p192. 24 Danaher, The Year in Ireland, 1972, p219. 25 Danaher, The Year in Ireland, 1972, p219. 26 Danaher, The Year in Ireland, 1972, p226-227.